Thursday March 3, 2016, at 1am, Berta Cáceres, a Lenca Indigenous woman and an internationally recognized leader, was assassinated in her home. Berta was supposed to be under special protection by the local authorities because of the innumerable death threats that she received. As General Coordinator of the Civic Council of Grassroots and Indigenous Organizations of Honduras (COPINH), Berta Cáceres was an organizer working at the frontlines in the struggle against the expropriation of land and water from her community by the construction of the Agua Zarca hydropower dam project in the Gualcarque River basin, promoted by the company Desarrollos Energéticos S.A. (DESA) and financed by foreign investors. “In our worldview, we are beings who come from the Earth, from the water, and from corn. The Lenca people are ancestral guardians of the rivers, in turn protected by the spirits of young girls, who teach us that giving our lives in various ways for the protection of the rivers is giving our lives for the well-being of humanity and of this planet… Let us wake up! We’re out of time. WE must shake our conscience free of the rapacious capitalism, racism and patriarchy that will only assure our own self-destruction. The atrocious crime happened just three months shy of the seventh anniversary of the coup d’état that devastated Honduras and had rippling effects across the American continent. In the first year of the coup, 43 people were killed – half of them were trade union members. Since 2009, there have been over 100 organizers killed, many of them Indigenous Peoples and small scale farmers engaged in nonviolent struggles for land and territory, including Tomás Garcia of COPINH and Margarita Murillo of La Vía Campesina Honduras. Thousands of people left the country, a place considered one of the most unsafe places on Earth. Unaccompanied children travelled alone to find safety in the US, only to be held in makeshift warehouses and deported back to the very place they had fled. At the same, the Inter-American Commission on Human Rights of the Organization for the American States reports that children from 5 to 23 years are receiving military training in Honduras. The murder of Berta Cáceres is a direct result of the ill-advised US policies for Latin America. It is past time for the US government to recognize that the financial and political support it has provided to the 2009 military coup and to the current Honduran government only fuels abuses by military personnel and the role of death squads against journalists, students and organizers, especially those at the forefront of defending land, territory, and natural resources. Berta had warned that DESA was once again invading Lenca territories, this time accompanied by private and public armed forces, including the military police called “Tigres” – trained and financed by the United States. Furthermore, the U.S. Agency for International Development (USAID) is directly supporting the Agua Zarca project through the USAID MERCADO program. Besides Berta, other leaders from trade unions and peasant, Indigenous and Afro-descendent organizations are frequent targets of death threats. Currently, the Honduran authorities are holding one member of COPINH and an international ally Gustavo Castro as part of the criminal investigation in a clear attempt to criminalize the victims of Berta’s assassination. 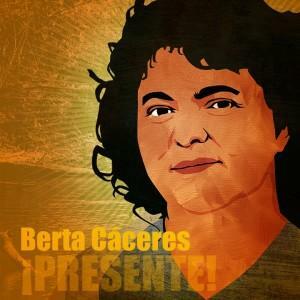 We ask friends and allies to participate in local actions to demand a prompt and full independent investigation into the killing of Berta Cáceres, by the Inter American Human Rights Commission. We call on everyone determined to uphold human rights to immediately contact their congressional representatives, advise them that the US support to Honduras and to the Agua Zarca hydroelectric dam project is destroying democratic rule in Honduras and killing innocent people, and demand an immediate end to such support. Finally, we support the rightful demands of COPINH and of all Indigenous communities to protect and defend their lands and to prevent unwanted megaprojects in their territory, starting with the Agua Zarca dam project on the sacred Gualcarque River. Next Monday, March 14 is International Day of Action Against Dams and for Rivers, Water, and Life. Around the country and around the world, organizations will be taking action in tribute to the powerful work Berta Cáceres led to protect the Gualcarque River, and in solidarity with the ongoing work of COPINH and of other movements in defense of water rights around the world. We dedicate ourselves to these struggles. This entry was posted in Blog, Press and tagged environmental justice, Honduras, human rights, indigenous, Land Grabs, peasant, Water, water grabs, women. Bookmark the permalink.